The Amador High School varsity softball team used a late rally on Friday afternoon to avenge a loss to rival Argonaut a few days earlier and even the Big Game season series. Trailing in the bottom of the sixth, Amador rallied to take the lead on an RBI by junior Mea Alleyn and held on for a 6-5 win at home. Coming off a 5-4 rivalry win on Tuesday in Jackson, Argonaut struck first in Friday’s game with a two-run home run from sophomore Haley Konvalin in the top of the first inning. Amador (6-5, 4-3 Mother Lode League) answered back in the bottom of the third inning with a two-run homer of its own by Alleyn, who also made some key defensive throws as well in the game. Argonaut (7-3, 4-2) went back on top 4-2 with an RBI single by junior Sophia Davis and a solo home run by sophomore Haley Konvalin. In the bottom of the fifth Alleyn earned a double the hard way. Caught between bases trying to stretch a single, she flopped flat to the dirt to avoid a tag and then barreled into a fielder on second, forcing her to drop the ball. Junior Hanna Mitchell drove Alleyn in with a triple to trim the score to 4-3 in favor of Argonaut. Amador rallied again in the bottom of the sixth as junior Harleigh Braswell had an RBI single and Alleyn brought in the eventual winning run. In the top of the seventh inning, Amador senior Katie Blankenheim, who pitched a complete game, got some strong support from her defense to close out the win. Amador and Argonaut will meet one more time this season on May 7 in Jackson. 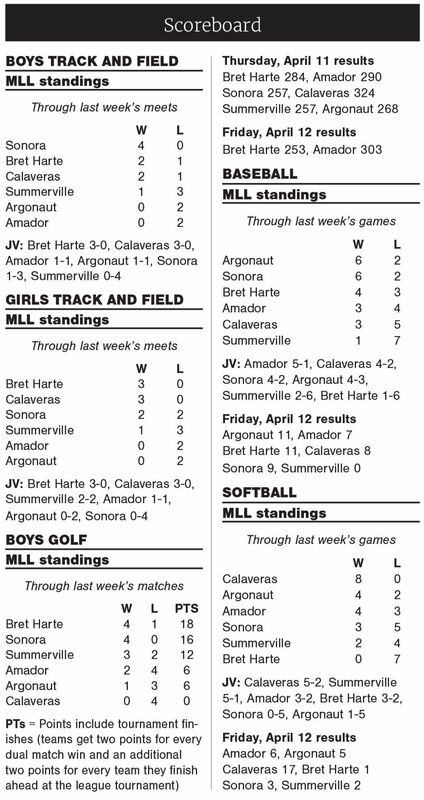 Calaveras had no trouble sweeping a two-game set with rival Bret Harte last week, outscoring the Bullfrogs 37-1 in a pair of victories. On Wednesday in San Andreas, Calaveras beat Bret Harte 19-0 in five innings. Highlighting the win for Calaveras, sophomore Angelina Deleon went 3 for 4 with four RBIs; and senior Alanda Cardon went 3 for 3 with two RBIs. Senior Bri Head and junior Kacie Cosgrove combined on the shutout in the pitcher’s circle. Two days later in Angels Camp, Calaveras dominated the Bullfrogs again, winning 17-1 on Friday afternoon. For Calaveras (9-2, 8-0), Cardon went 4 for 4 with two triples, two runs scored and three RBIs; senior Alexis Dawe had a double and a triple; and junior Keelie Koepp went 3 for 4 with three runs scored and three RBIs. Offense was the name of the game in Friday’s JV softball rivalry game in Sutter Creek with Argonaut coming out on top 15-12 over Amador. Freshman Ali Strickland led the way for the Mustangs, going 3 for 4 with a trio of doubles and five RBIs. Amador was led by sophomore Hannah Behrman, who lined a triple and later stole home. She accounted for four RBIs and has yet to strikeout this season. Her teammate Ashlynd Dunn was 1 for 1. Madison Macey pitched a complete game for the Mustangs.